“In India, killing cows and the consumption of beef is banned in most states. 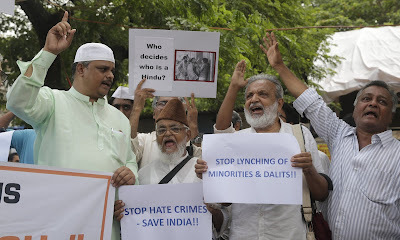 Since Modi and his party assumed power in 2014, this beef ban has been used by Hindu nationalists to justify their attacks on innocent Muslims in public. [….] [Prime Minister] Modi’s government … routinely disseminates fake news, targeting and demonising Indian Muslims.” The full article from The Guardian by Rana Ayyub is here.